In a state famous for secession and Old South ideals, Greenville stands as one of South Carolina’s most precocious and complex communities. Settled in the inviting shadows of Paris Mountain along the Reedy River, both city and county struggle between the traditional values of a distinct Southern heritage and the progressive trends of a growing, diverse population. This book is a unique glimpse at the people, the schools and the businesses that dramatically transformed a Tory plantation into a sprawling metropolis. 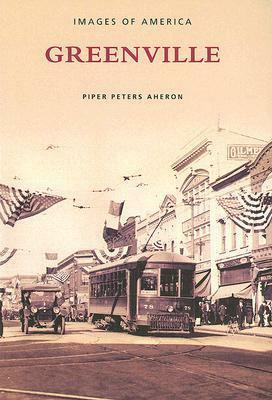 From rustic portraits of mineral springs and mansion resorts to the snapshots of fast trolleys and overcrowded cantonments, this book highlights a special place that has impacted the world of sports, politics and science in the United States. With the help of Greenville Technical College, Furman University, South Caroliniana Library, and other archives, Piper Aheron, the author of the much-celebrated Oconee County, has compiled a visual treasure that truly captures the energy and spirit of this place. Whether a longtime county resident or a newcomer to the region, every reader will be intrigued as history repeats itself on the pages and in the images that depict a people noted for a vitality and beauty that will last well into the next century. "It humanizes historical personages... a quality volume..."
"...easy... a breeze to read."